Comes in assorted colors and design with poly resin figurine on the neck. Minimum quantity for "Badshah Easy-Lite Hookah Charcoal 100 PC" is 1. 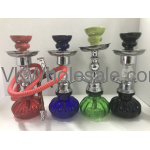 Minimum quantity for "Blue Lighted Mini Hookah 7.5" 9 CT" is 1.